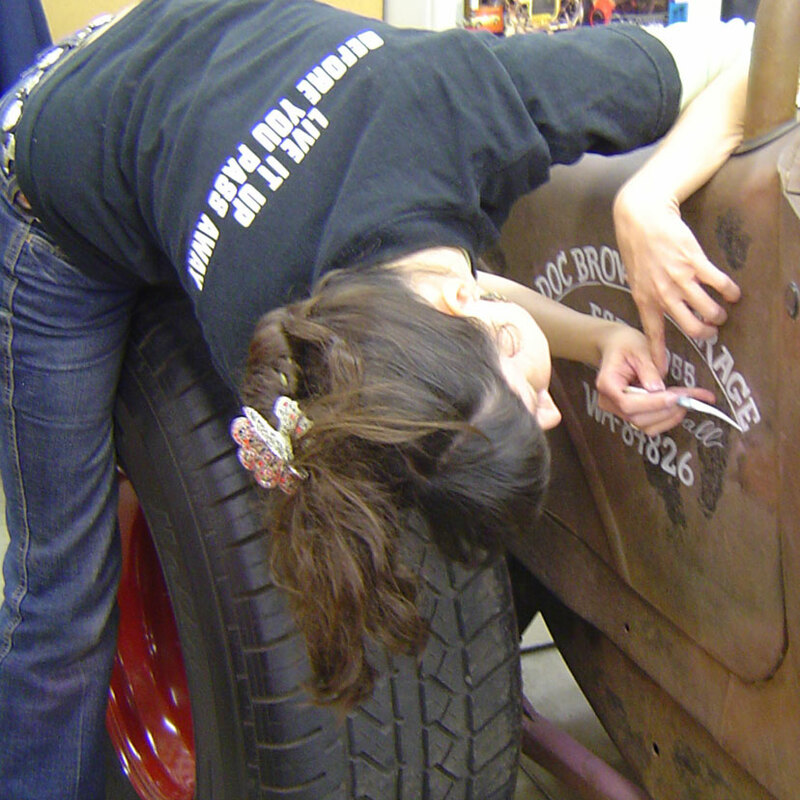 Julie Fournier paints canvas, pinstripes cars, motorcycles, letters, and more. She doesn't confine herself to one medium, and, although she's well known by many for her oil paintings, she does not confine herself to one discipline, considering herself to be a multi-media artist: Julie paints traditional oil on canvas, does calligraphy, pinstripes under the name Junkyard Jules, is a potter, a mosaicist, a tailor/seamstress, a sculptor, a graphic designer as well as an Industrial Designer, and more, in a wide variety of styles that has won her a solid reputation and recognition for her work. 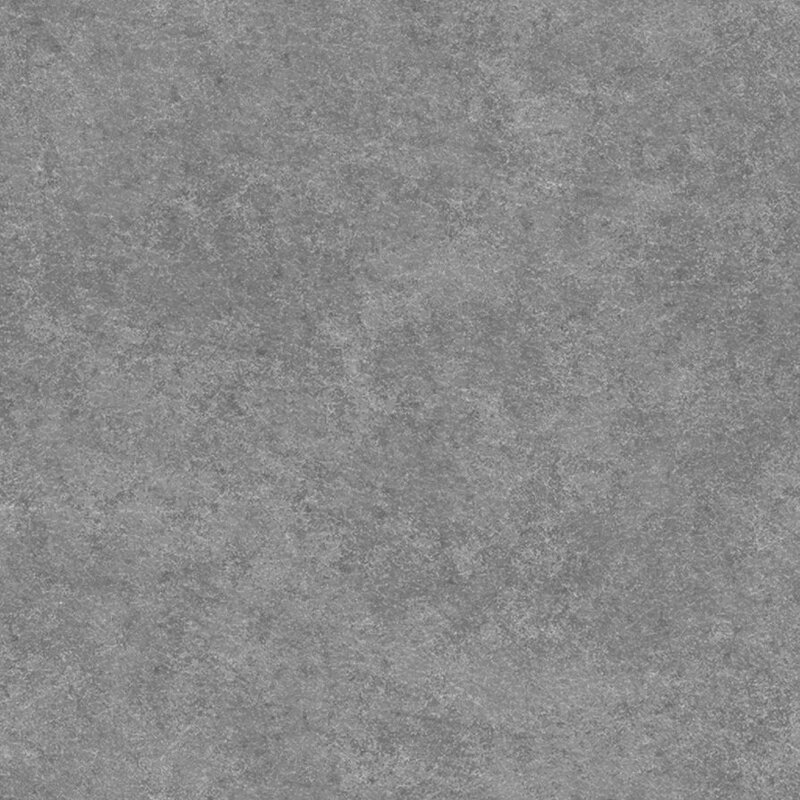 Her website reflects her diversity of style and materials that she expresses her creativity with. Neo Realism best describes Julie's style. Events in modern American culture that have impacted our lives and our relationships with each other influence Julie's work. Often overlooked aspects of daily life inspire her, as can be seen in the variety of media she uses to rediscover the banal or forgotten in all its innate beauty. Her graphite drawings isolate objects in minute detail, focusing attention on the intricate lines in a pair of blue jeans or textures of surfaces. By painting glassware, she utilizes the transparent vessel and, through a playful yet defined sprinkling of color and shape, turns the utilitarian form into a fuller sensual experience. Her stained glass mosaics and painted furniture artwork often involve found objects, bringing society's discards to center stage. The subjects she chooses for her oil paintings are taken from everyday life, challenging traditional notions of beauty, social class and human interaction. 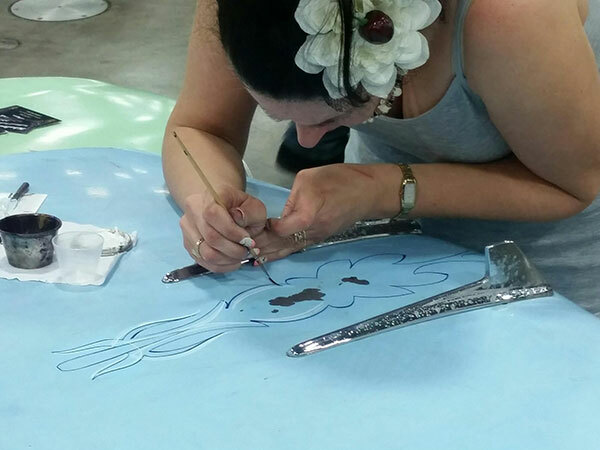 In her designs, Julie always strives to communicate and connect with the viewer. Julie has been called "a reporter on modern life," seeing that which the crowd has passed by in it's haste to move on to the next sensation. Focusing on the missed opportunity, the bypassed alternative, the meaning and wonder working within subjects or moments, Julie's work is accessible by way of conveying what her artist's eye has seen, capturing moments and sensations and freezing them in time so they can be share. Ultimately, Julie's work focuses the viewer on relationships in the world around them. 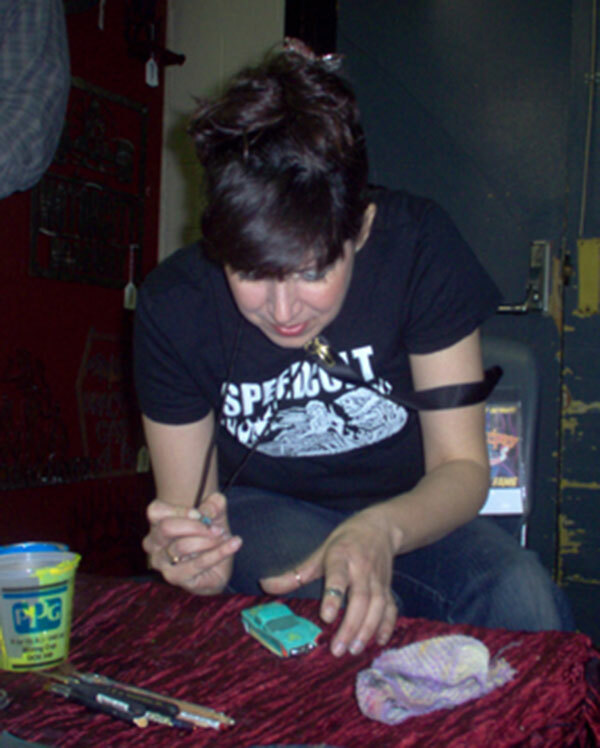 Currently Julie is working full time as an artist, freelance designer and pinstriper. 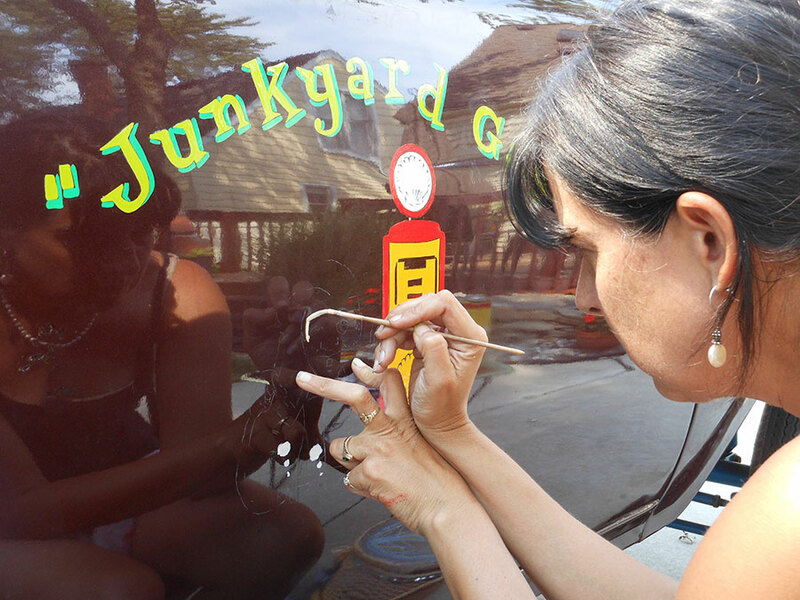 When not at her studio, Julie plays pool, wrenches on her classic Mustang, or pinstripes cars under the name "Junkyard Jules". See an interview of Julie on Youtube. 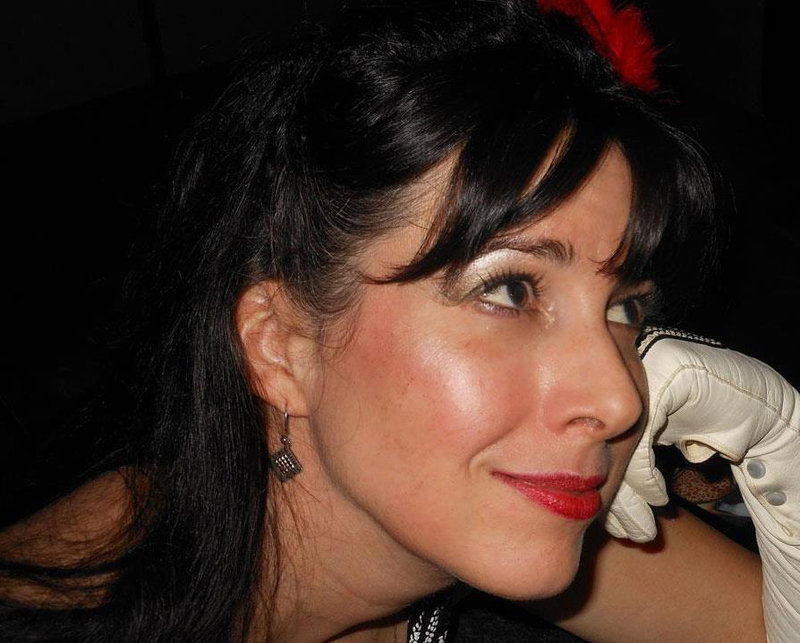 Find Julie on Facebook, Instagram, Linkdin, and Twitter. IDSA, Detroit By Design, National Gold Key Honor Society, President of Lincoln Homeowners Society.